Ideally located minutes away from Iguazú Falls and downtown Iguazú, Loi Suites is surrounded by the characteristic lush vegetation and wildlife of this tropical region. Indulge in a luxury stay at this excellent 5-star hotel where attention to detail and personalized service are the rule. With more than 160 luxurious rooms available, all fully-furnished with a mini-bar, Wi-Fi access, and a security deposit box, no expense is spared to make your stay as comfortable as possible. After a long day of visiting the falls or the jungles of Iguazú, guests are invited to use the 800 square meter swimming pool, the recreation lounge or have a delectable dinner at one of the hotel’s two exquisite restaurants. This hilltop hotel’s name is derived from the breathtaking panoramic view of the Iguazú and Parana Rivers. This luxurious Puerto Iguazú hotel features all the amenities and services a guest could hope for during their Argentina vacation. The five story hotel offers 91 rooms, all fit with mini-bar, safe box, and wireless internet. Take advantage of the tropical gardens, semi-olympic pool, children’s pool, solarium, and outdoor Roman Bath. The hotel offers a business center with computers for guests, casino, entertainment room, playground, room service, massage room, complimentary shoe shine, and trilingual personnel (Spanish, English, and Portugese). For hungry guests, there are plenty of indoor and outdoor options within the hotel. The Panoramic hotel will make your stay in Puerto Iguazú enjoyable. The only hotel located directly inside Iguazú National Park, Sheraton Iguazú offers its guests a truly memorable stay. The hotel is walking distance to the main attractions of the park, including La Garganta del Diablo (the devil’s throat), and therefore offers the best combination of convenience and luxury. Most of its 176 rooms feature balconies with spectacular views, and are equipped with the latest modern amenities, including high speed internet access and cable television. The restaurant, Garganta del Diablo, offers a great view of its namesake as well as live entertainment and excellent international cuisine. There is also a buffet and cocktail bar, and a poolside bar offering snacks and light fare. The hotel’s spa is state of the art, with Vichy shower, whirlpool, steam room, sauna, fully equipped gym, facilities for yoga and Pilates, and spacious Zen gardens. Located near one of the world’s most beautiful natural wonders, Iguazú Falls, this luxury hotel offers immaculate service within a lavishly decorated environment, an unexpected gem in this tropical-setting. Palm-trees and plants adorn the inside and outside of this lush hotel. Suites are classically decorated with plush sofas, comfortable sitting-areas and private terraces overlooking the pools and gardens of this immense hotel. Aside from the amenities expected from a 5-star hotel, such as a health and tennis club, a library lounge and a playland to keep the kids entertained, the Iguazú Grand Hotel offers “one of the most swinging casinos in Latin America.” With 27 gaming tables and 196 slot machines to choose from, the fun never stops here. Combine relaxation and nature with a stay at the Aldea de la Selva hotel. Nestled in the green Paraná rainforest, this lovely hotel was entirely built with local materials. All comfortable rooms are spacious and include a private balcony with a hammock overlooking the rainforest. They are also fully equipped with modern amenities such as a mini-bar, cable TV, air conditioning, and safety box. Aldea de la Selva features a delicious restaurant, El Nido, accessible by footbridge, as well as three swimming pools and two Jacuzzis. Guests will also find customized environmental activities at their disposal, such as bird watching, zip-lining, and guided tours in the rainforest. Located on the bus route to the Argentina side of Iguazu Falls, Grand Crucero is an ideal place to experience one of South America’s great natural wonders. 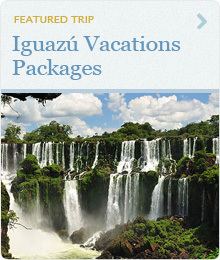 The hotel boasts easy access to many of Puerto Iguazu’s attractions including museums, the zoo, and La Aripuca. Grand Crucero Hotel is equipped with a full range of fine amenities, including two restaurants, a bar, swimming pool, and fitness center, making this hotel an inviting place to relax after a full day of exploration and adventure at Iguazu Falls. Choose from 81 well-appointed rooms, some of which have balconies with views to the city. La Cantera Jungle lodge is ideally located on the Argentinean side of the falls near the town of Puerto Iguazú, only 10 minutes by car to the entrance to the Iguazú National Park. Guests at the hotel are surrounded by beautiful natural scenery that is common for this frontier region of Argentina. Carefully built with the preservation of the environment at heart, La Cantera Lodge strives to offer first class amenities and great professional service. All 24 rooms, decorated with warm and cheerful colors, feature Jacuzzi-tub, plasma screen televisions, and spectacular views of the surrounding jungle. The hotel also boasts an excellent restaurant as well as a bar and a swimming pool to relax after a full day of sightseeing. Standing only 100 meters from the Three Borders Landmark, this excellent 4-star hotel provides an excellent view of the merging of the Iguazú and Parana Rivers. An elegant and ample well-lit lobby welcomes you to Amerian Portal de Iguazú Hotel, which features 102 rooms all fully equipped with the best amenities and decorated in a tasteful modern style. Enjoy the LCD TV with cable, fully-stocked mini-bar and 24 hour room service at your disposal. For a truly luxurious experience, ask for a Suite, where you can relax in the bathroom’s private Jacuzzi and enjoy the most beautiful views. With two bars and two restaurants, there is no lack of food or drink at this impressive establishment. The Hotel Saint George is located in the center of Puerto Iguazú, minutes from Iguazú Falls, the airport, and the international bridge to Brazil. The hotel features 100 rooms including one Suite all designed and furnished to provide guests with the utmost level of comfort. All rooms are equipped with mini-bar, air-conditioning and cable television. The hotel boasts a swimming pool surrounded by lush jungle vegetation, a hot tub, sauna, gym, game room with ping pong and foosball, and a gift shop. Enjoy a delicious meal at the hotel’s cozy restaurant, La Esquina, which offers a wide range of international and regional dishes. You can also relax sipping a cocktail at the Quincho Bar or Lobby Bar. Located in the heart of Puerto Iguazú, a few blocks from Avenida Costanera, Jardin de Iguazú offers guests a great range of excellent services. Featuring 30 comfortable and fully equipped rooms, some dotted with views of the garden and swimming pool, Jardin de Iguazú strives to make guests feel at home. This beautiful hotel is complete with free wireless internet, bar service, and swimming pool where guests can enjoy relaxing hydro-massages. The hotel’s central location makes for a short walk to shops and restaurants, and the city’s main attractions. Secluded amongst lush flowering bushes, making for an intimate climate in the middle of tropical paradise, this 4-star hotel truly lives up to its namesake. Located on the way to the Iguazú falls, Orquideas Hotel is perfectly situated only a few minutes away from every major attraction in the area. All 60 rooms are decorated in a classic and tasteful style, and provide every necessary amenity, such as air-conditioning and heating, cable television and a safety box. For a little more privacy, ask about lodging in one of the 11 quaint cottages located in the middle of the jungle, dotted with a private swimming pool. Unwind in the gym or swimming pool, dine and relax on the tropical terraces of this peaceful hideaway, or simply rest in your room and take advantage of room service. Located right in the Heart of the Misiones Jungle in beautiful and lush Iguazú, and only a few minutes from the region’s famous waterfalls, this hotel offers excellent services in a truly magical setting. Rooms are spacious, comfortable and brightly-lit, and all feature amazing views of the city or the tropical vegetation outside. Rooms come equipped with cable television, individual cooling and heating system, mini-bar and safety box. If the heat gets to be too much, take a dip in the hotel’s large swimming pool. Also, take advantage of the forest and garden walking tours set up by the staff. Finally, dine under a beautiful chandelier at the hotel’s Caviar Restaurant.